Introducing the Adsorption Chiller, based on an innovative green technology, and the first of its kind in India. A lot of low grade process heat (50°C – 100°C) generally goes waste because of the technology gap to utilize it effectively. 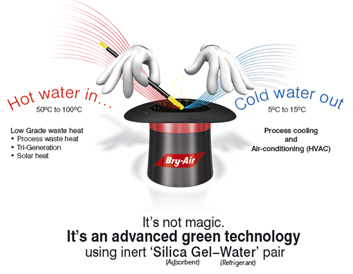 Bry-Air has launched a futuristic product, using advanced green technology, which can now use this low grade waste heat for cooling without any environmental damage. It is a first ever product being launched in India to tap the abundant low grade waste heat available in process industries and use it for process cooling or air-conditioning (HVAC). This eco-friendly solution cuts down CO2 emission and reduces energy expenses. The Bry-Air Adsorption Chiller is based on an advanced green technology using inert Silica Gel (adsorbent) and Water (refrigerant) pair. It has unbeatable advantages like ultra-low electricity consumption, negligible noise and vibration, life expectancy of more than 25 years, negligible maintenance, etc. It is ideal for industries like Power, Food & Beverages, Pulp and Paper, Solar, Chemical manufacturers, etc. and for Commercial areas like Offices, Buildings, Hotels, Malls, etc. 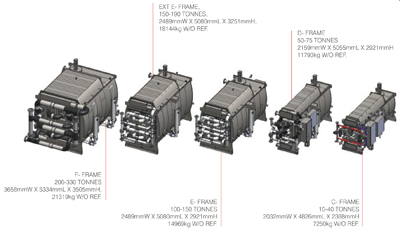 Click here to view Adsorption Chiller Video. The Bry-Air Adsorption Chiller is based on an innovative green technology, and is being manufactured in India.